Suddenly finding herself in hell, Twilight is presented with one fact: for the rest of eternity, she's stuck in a library holding every book possible. She's expected to organize them and is allowed to read them. What makes this hell, again? Sunset Shimmer is having the worst day of her life. She used to be important. She was the personal student of Princess Celestia. 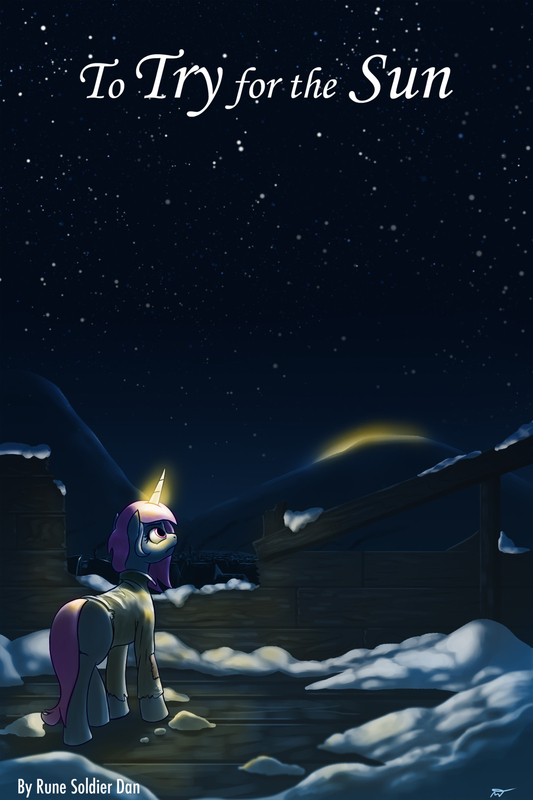 She was a future leader of Equestria. She was the kind of mare that everypony envied. Today, it's all crashing down around her. Alternate Universe: What if Sunset Shimmer hadn't gone through the mirror? Celestia: a filly of twelve. A cynical, hungry pauper, with a young sister to protect and feed. But the food has run out. Winter has gripped the land for too long, and now the pair face starvation. The cynic in Celestia knows she can't move the sun. But the child in her wonders... and so she tries. Idol Hooves holds a special place in Equestria. He's probably the only exiled changeling to serve in the Royal Guard, or at least, that's what he expects, as exiles don't really broadcast that fact. However, it's well known that Princess Celestia loves all of her little ponies, and her guards perhaps more so, and that makes it one of the best ways for a changeling to discreetly feed. But how does a changeling even get there, let alone get exiled in the first place? For that matter, why would it ever go to Canterlot? Set a number of years before the series proper, before Luna’s redemption, Idol details how he was exiled, the ponies he’s met, and the series of misadventures that led him to joining the Royal Guard, and should continue a good ways into the series, as something of an alternate perspective. Soon, he’ll have to deal with a boisterous new princess to serve and a royal wedding in the works bringing a third to power. Will his old instincts bring this new life crashing down around him? What precipitates Chrysalis’s ill-fated assault on Canterlot? Is it really so wrong for a changeling to enjoy good craftsmanship to an obsessive degree? And a TVTropes page here. And an Ask Blog of questionable canonity! Art by Egophiliac of Idol and his Daring Duckie Please don't tell him what that brush is meant for. And changed the character tags a bit. You'd think that being trapped in stone would mean that, if nothing else, I could get some peace and quiet. Unfortunately, it seems that Celestia has other ideas. She has appointed these ponies... these 'Keepers', as she calls them, to keep me entertained during my incarceration. Honestly? I'd prefer the boredom. Princess Celestia, tired of the constant pressure that ruling a nation puts on her, decides to take a day off and let Luna take her responsibilities for a day, something the younger alicorn is more than happy to do. She disguises herself as a pink maned pegasus pony named Sunny Skies and decides to go walking around Canterlot without any supervision. Unfortunately for her, not all parts of Canterlot are as safe as the palace, and she finds herself at the wrong end of a gang of muggers, who decide to kidnap her for a ransom when they see how much money she has on her. Go here for the French translation! Twilight isn't having a very good day. An experimental spell blew up in her face, an army of changelings is attacking Canterlot, and she just died. Yet somehow, it looks like it's going to keep going downhill from here. Given the chance to correct what's gone wrong, Twilight swears she's going to fix all this even if it kills her. Which it will. Frequently. What started as a normal friendly visit ends up taking two ponies on a trip down memory lane that leads them both to realize their friendship began even before Rainbow Dash's first sonic rainboom. It turns out that the magical land of Equestria is not a flat plane covered by a bowl of stars after all. This is big news to Queen Chrysalis. If the moon is actually a place, then she can travel there, claim its magical energies, and finally get revenge on Celestia, Twilight Sparkle, and everypony else. Of course, there are problems. One problem is that everypony else is also rushing to get into space. Another problem is that Chrysalis really has no idea how to do it. Fortunately a certain earth pony with a taste for cherries is willing to help... provided she gets to fly the ship, and provided Chrysalis keeps the space program honest and open and legal. Together, Chrysalis, Cherry Berry, and a horde of brave-but-dumb changelings will make world history... or, more likely, they'll make a lot of really big explosions. Inspired by Kerbal Space Program. Current cover art by Jason Meador aka texasuberalles. TVTropes page here! Thanks to GymQuirk for making it! This is a collection of various stories, short and otherwise, to go along with The Changeling of the Guard. They aren't absolutely necessary, but the intention is to provide some background or additional material. Things like Topaz's research notes on Changelings, stories involving the other characters, and various insane things Idol has done that don't quite fit into the main plot. They might be chipper, they might be sad, but they're all canon to the main fic... or to whoever from the story is relating them. Chapter 1 is the Nurse, mentioned briefly in Moonlighting, who brought Idol the Nymph.